1917	Pottawatomie	63N3410E1180003	  OK State Highway Dept. A popular variation on the reinforced concrete arch, principally during the teens and twenties, took the form of a rainbow or through arch. In this case the arch stands above the roadway and supports the deck by way of vertical ties between the crown and the floor beams. Only two of these types were built in Oklahoma and one survives. On what was once a main road north-south artery, State Highway 18, also known as the Williams Highway, the state constructed a rainbow arch near Shawnee in 1917. 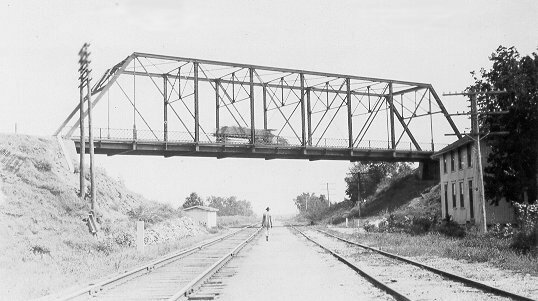 Somewhat inconclusive historical evidence indicates that this 67-foot span over Squirrel Creek was built by local Pottawatomie Indians along with convicts from the state penitentiary at McAlester. A handsome example of the type, it serves traffic into campgrounds and a neighboring U.S. Public Health Service facility (Figure 78). Figure 78. 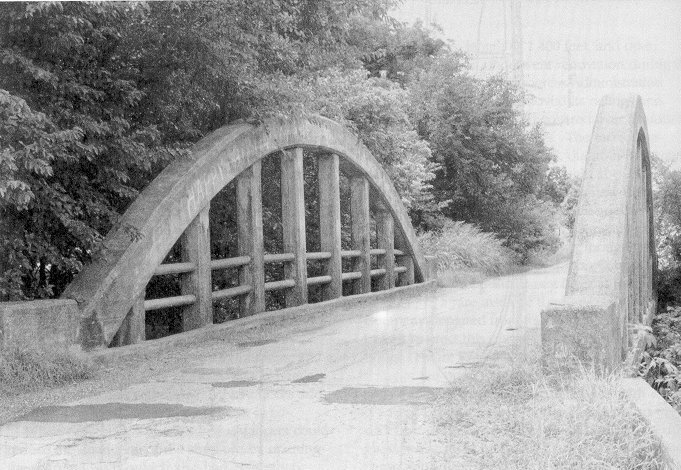 Bridge 63N3410E1180003 is Oklahoma's only concrete rainbow or through arch. It is located between Shawnee and Tecumseh in Pottawatomie County.